Voor alle vaders opgegroeid zonder vader. De brief van Opa aan gene zijde. Ouder worden. Ouder zijn. Ik droomde. Wij beiden oud. Jij vader, ik vader. Wij beiden ouder. Ouder. Ik was het. Jij werd het. Vaders zijn ouder. Ik werd niet ouder. Jij werd ouder. Zonder mij werd je ouder. Zonder vader vader zijn. 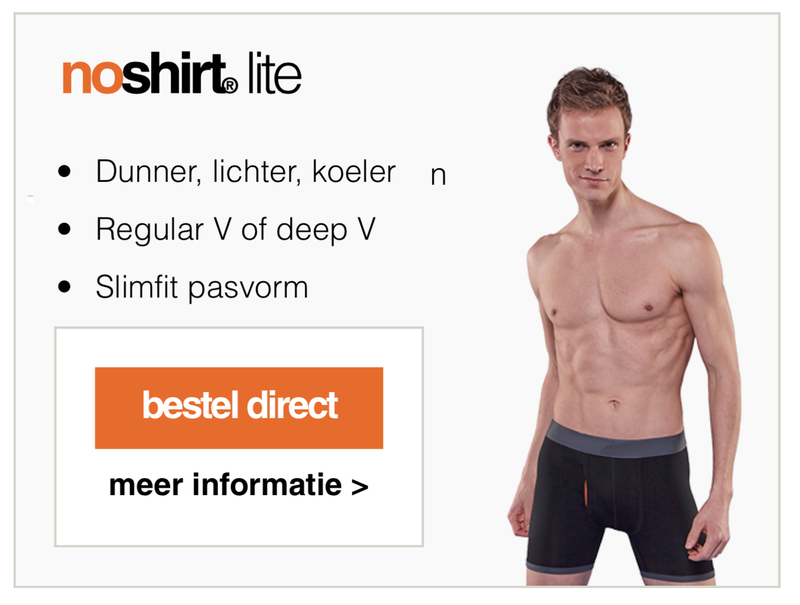 Geen voorbeeld. Geen vraagbaak. Geen telefoon die opgenomen wordt als je belt. En toch deed je het. Op gevoel. Goed gevoel. Mijn genen leven. Dankzij jou. Missie geslaagd. Iets waar je trots op kunt zijn. Iets waar ik trots op ben. Goed gedaan jochie. My initial excitement about Paper for iPhone turned into disappointment. 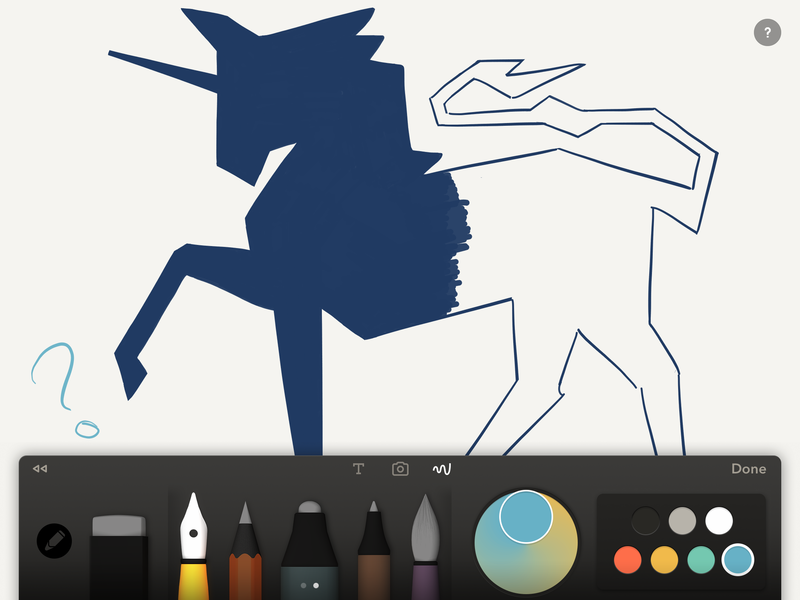 My favorite sketch App got mutilated on iPad. 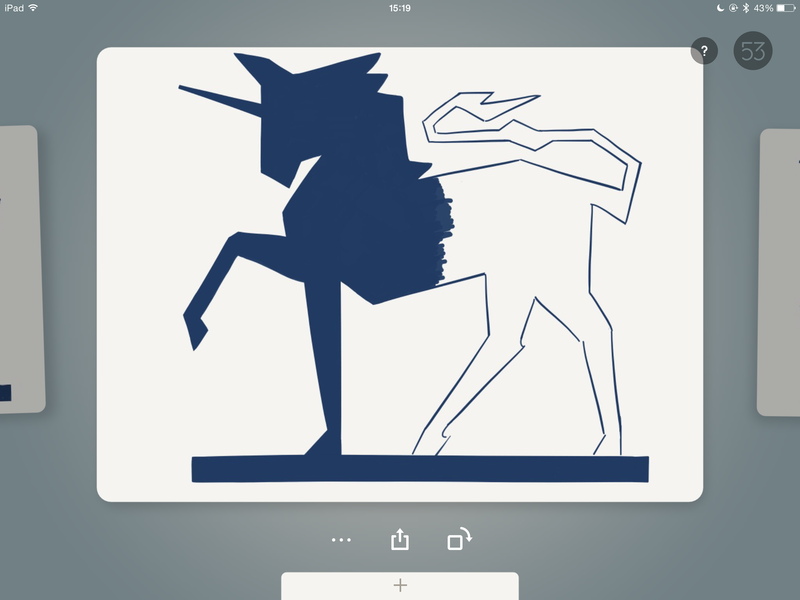 In Fifty-Three’s effort to create Paper for iPhone some fundamental thinking about usability went wrong killing great user experience on iPad for the sake of iPhone. The ’Moleskine’ view that differentiated Paper from mainstream tools such as PowerPoint and Keynote got replaced with Spaces, spaces with covers that actually, well … don’t cover 😦 and the subtle two finger rewind and forward (‘undo/redo’) gesture got replaced with … rewind and forward buttons. Ouch! The above works well from the viewpoint of efficient code development but is wrong from the viewpoint of usability. iPhones and iPads are **not the same** and are not used in the same way; their usability is different. Before I discuss the usability error made here I would like to share with you what makes great user experience in the first place. Freude am Fahren – Great user experience is nothing new. Look around. My favorite metaphor for user experience is that of the automotive industry. And within this industry the BMW brand in particular as metaphor for the ‘A-brand’. If you like you can mentally replace BMW with Audi or Volkswagen as respective metaphors for Google, ’Vorsprung durch Technik’, or Microsoft, ’Das Auto’. Whatever you prefer. 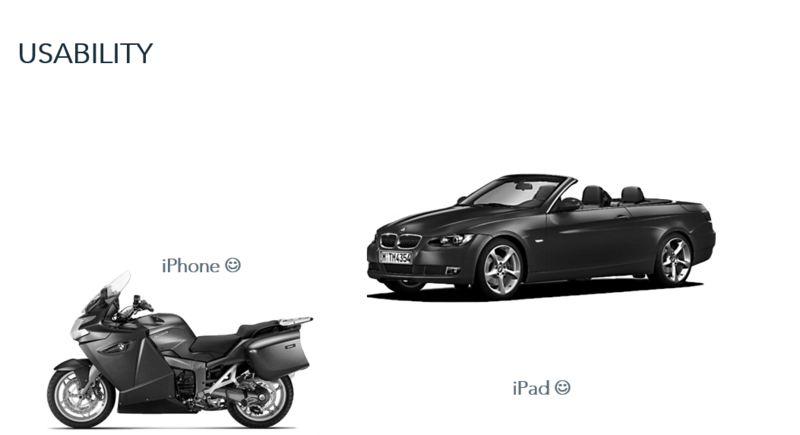 A bike, a convertible, a SUV – Three devices. All vehicles. All BMW. Same quality. Same service. Same function. Driving from A to B. Find the differences – Both are same size SUV’s. Both drive from A to B. Both have 4 wheels and a steering wheel. Quality of Service makes a difference. Basic versus Premium. Both have a place in life and are marketable. 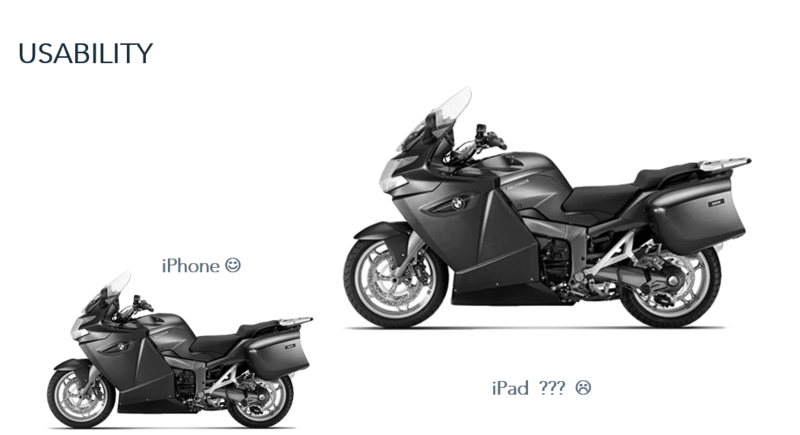 Three different devices – A bike, a convertible, a SUV. All vehicles. All BMW. Same quality. Same service. Same function. Driving from A to B. Despite the same function, the same quality and the same ease of use their usability is completely different. Two wheels less and a different steering wheel make a huge difference for agility; roof and size make a huge difference for passenger capacity. The **use of a function** decides what device needs what functionalities in a particular situation of usage. Design Matters – Both BMW. Both are same size SUV’s. Both have 4 wheels and a steering wheel. Both drive from A to B. Function is exactly the same. Quality is exactly the same. Ease of use is the same. Their usability is identical. Yet one of them doesn’t sell where the other one actually sells. 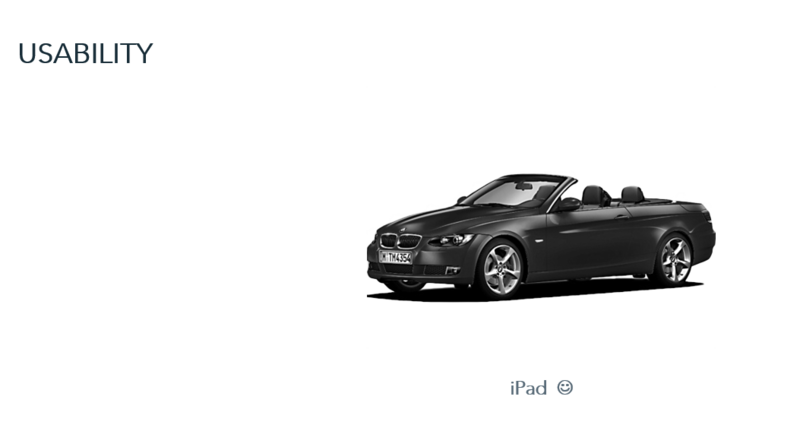 Design Timeline – All BMW. All 5-series. Same function. Same quality. Identical usability. Good design is both timeless ánd contemporary. Design requires maintenance. Well maintained design lasts and provides sales retention. 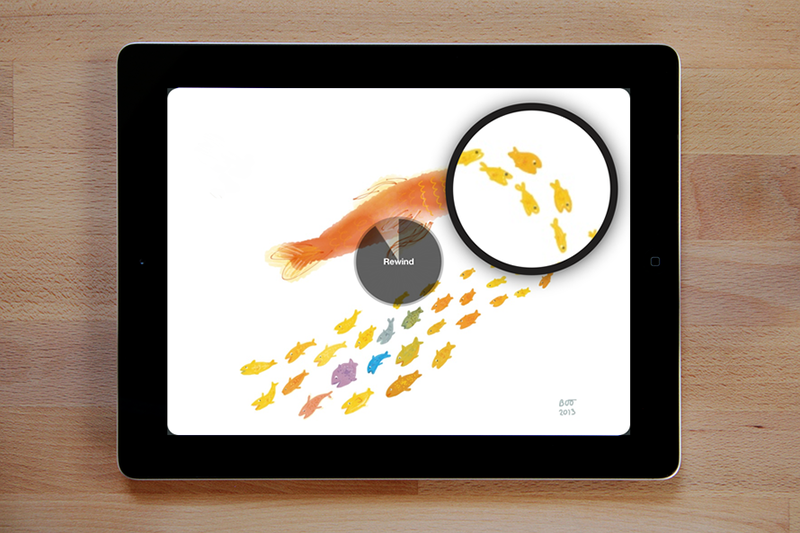 The below image reflects, metaphorically speaking, Paper for iPad (Video) before last weeks update. 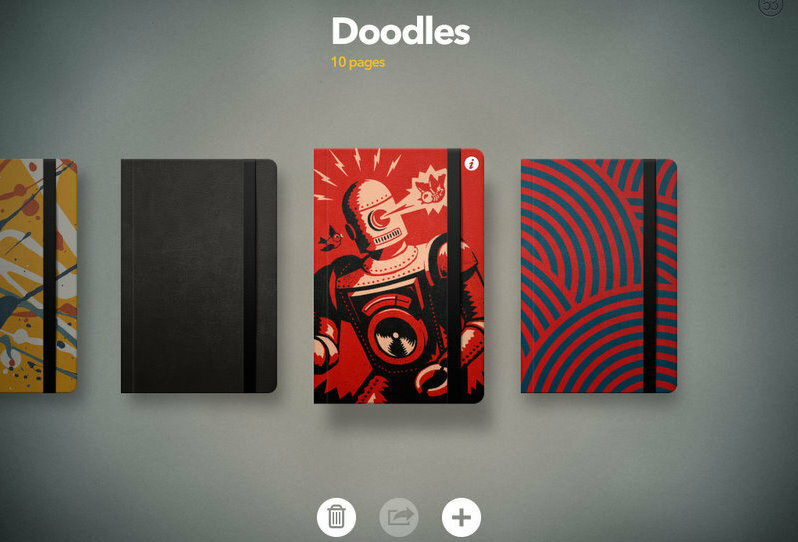 I was a happy Paper user experiencing great experiences doodling, scribbling, sketching, drawing and dreaming away whilst showing off this great App and of course some of my work. I noticed that Fifty Three was about to release Paper for iPhone and I got excited about this next step. Paper for iPhone would come in handy. I had imagined Paper for iPhone to be ‘same function’, ‘same quality’ and ‘different usability’. 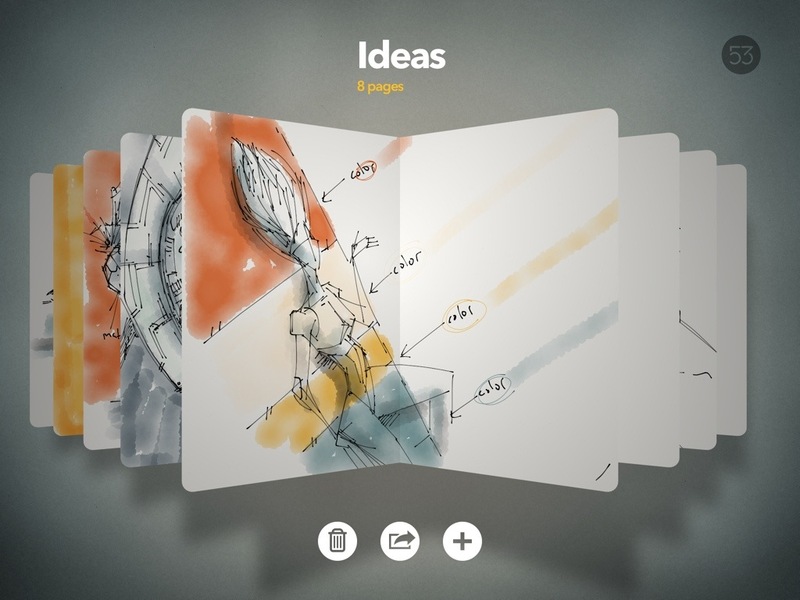 Basically an agile version of Paper for iPad designed for the same function but different use. Of course I didn’t expect Paper for iPhone to be the same as Paper for iPad. 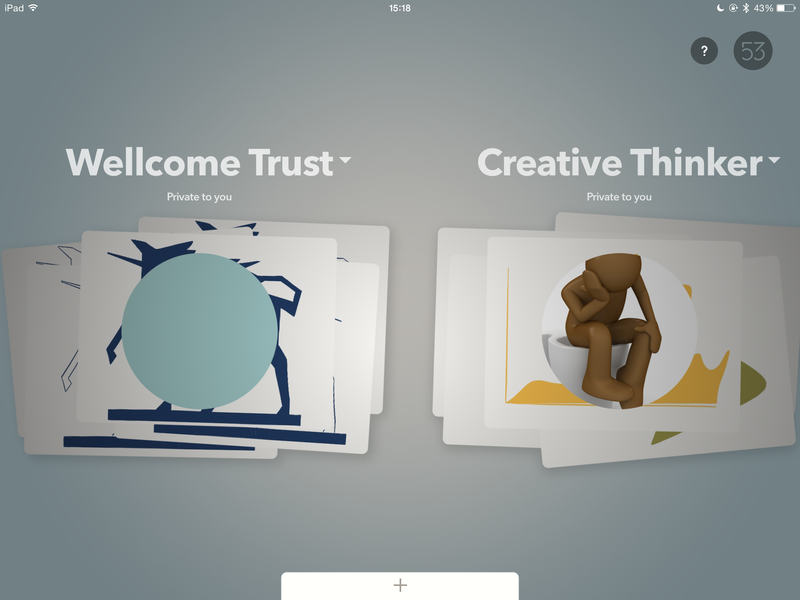 The ‘Moleskine’ views would just be too big for the tiny iPhone screen. So far so good. But what had meanwhile happened to Paper for iPad ? I did expect an additional use for Paper on iPhone but changing the comfortable convertible I was used to in a bike ??? That I didn’t see coming. I like having both a convertible and a bike because they serve different uses. I can also see Spaces help me navigating my doodles and sketches but why kill the ‘Moleskine’ view on iPad ? This view was great for presenting and used to be a differentiator for Paper when compared to mean stream stuff like PowerPoint and Keynote. Stop talking innovation. Start taking long hot morning showers. Let your mind wonder away. Let your best ideas occur. Talking innovation won’t bring innovation. Cut the crap and start taking long hot morning showers. Let your ideas evolve into true innovations. After a good night’s sleep and some vivid dreams your mind has processed all impressions of the day before. Every thought, every experience gets regrouped, new synaptic connections are created, ready to be processed by your conscious mind. In the shower the hot water flowing your skin relaxes your mind. You are alone, no distractions. The monotonous sound of the water makes your subconscious take over your washing routines, making way for your subconscious to reach out to your conscious mind. Wednesday July 30th 2014 something key happened in the Dutch Cloud. During summary proceedings, ING Bank demanded AFAS Personal to stop offering an automated service that uses customer usernames and passwords of ING Bank’s internet banking service Mijn ING. AFAS Personal is a online bookkeeping service that offers automated download of bank transactions for accounting purposes. Mijn ING usernames and passwords are used with customer consent, today’s security standards are applied and verified by 3rd parties. In ING Bank’s opinion the automated service AFAS Personal is providing introduces a security risk. According to ING Bank it is not ‘safe’ to have AFAS Personal use Mijn ING usernames and passwords. The judge decided that ING Bank was right and ordered AFAS Personal to stop the automated download service. Once upon a time in the West it was common to sock away money in a safe. At that moment in time a good practice to keep belongings safe. Without the key one could not open a safe. So far so good. Unfortunately safes got busted. A security rat race had started. Bigger safes with better locks were build. It was a matter of time that safes got busted again. Keeping belongings safe became expensive. Some entrepreneurs noticed the trend, build vaults and offered people the service of secure central safes. Like safes, these newly born banks got robbed and busted as well. Vaults got even bigger and more secure. Banks hired security guards, bought armor plating and weapons. The rat race continued anyway. Since then banks have transitioned from deposit money to online banking with different but similar defense systems. The 2008 financial crisis demonstrated that belongings (and trust) can still vaporize inside the most secure vaults. The above is illustrative of the fact that banks themselves have become a security risk. If governments had not intervened, belongings would have burned inside safes that were supposed to be fireproof. This raises the question of who owns the content in a safe and it’s key. Obviously banks don’t. Customers do. If customers no longer trust their banks they should at least have the right to keep record of what’s in their safe and be allowed to share the key with trusted parties. What if banks bust again ? Who proofs what was in the safe ? The bank ? In addition to wednesday’s news it should be mentioned that ING Bank recently announced a pilot program to sell customer transaction data, be it anonymized and with customer consent, to 3rd parties for commercial use. This announcement let to a fierce public debate in The Netherlands about data privacy and the role of a system bank such as ING Bank. Due to public opinion ING Bank decided to hold off the pilot for now. Apparently public debate is required to wake-up corporate institutions, governments and legislators, and have the public correct wrongdoings if all controls fail. The Terms & Conditions of the Mijn ING internet banking service state that customers may only use usernames and passwords themselves and only when using Mijn ING’s web site. In the case of ING Bank against AFAS Personal the judge decided that, through the automated logon service, AFAS Personal is encouraging customers to violate the Mijn ING Terms & Conditions and therefore ordered AFAS Personal to immediately stop the service. Through the Schengen Treaty 26 European countries have agreed to abolish passport and any other type of border control at their common borders. The Schengen countries function as a single country for international travel purposes, with a common visa policy. The Schengen countries have eliminated internal border controls between Schengen members, strengthened external border controls with non-Schengen states and trust each other . The Schengen area encourages the free movement of goods, information, money and people. Cloud is nothing new. Cloud has always been there and will always be there. Cloud isn’t a marketing hype either. Cloud is the water we drink, the food we eat, the electricity we consume, the money we draw and the intellectual property we store. Cloud is also about the good, the bad and the ugly. There’s no way back. We all are interconnected as we live on the very same planet. Customers are entitled to know who’s good, who’s bad and who’s ugly. ING Bank is worried about so called ‘man in the middle’ attacks. But is it fair to call all ‘men in the middle’ ugly or bad ? Cloud is about trust. Banks, of all people, should know that security is important but that trust is even more important. The judge should have considered the interests of the customer and not those of ING Bank or AFAS Personal. The judge could have focussed on re-gaining public trust. Other banks such as ABN-AMRO, Rabobank, SNS Bank trust AFAS Personal. Even ING Bank trusts AFAS Small Business, a similar service for business customers. ING Bank should speak up and be clear about who’s good, who’s bad and who’s ugly.